Choose what kinds of opportunities you'll receive in your pharmacy system to help focus on high priority patients. If you're receiving too many notifications in your pharmacy system and want to focus on certain opportunities, customizing Amplicare Assist will help streamline your workflow and promote your pharmacy's services effectively. 1. Hover over Amplicare Assist in the drop-down menu. 3. From here you have several options for customization. You can select which types of opportunities to see in your pharmacy system by toggling to “active.” Generally, we recommend activating all available opportunities. However, if you’re just getting started or if you’re an extremely busy pharmacy, it’s helpful to provide your pharmacy with focus (you don’t want to overwhelm your staff!). Consider activating only the top priority opportunities based on your pharmacy’s needs. We highly recommend that the “DIR Impact” opportunities always remain active. You can also customize where your notifications appear in your pharmacy system. If the notifications are covering information on the screen, choose a different positioning. You have the option to automatically hide notifications if an action isn’t taken within a set amount of time. The default setting is 30 seconds, but you can select a higher or lower amount of time depending on your preference. Another option is to choose a time limit for when a notification appears after the most previous notification was displayed. The default setting is a 5 minute interval. You can also select the time limit for when you want to see another notification displayed after a notification is dismissed. The default time interval is 25 minutes, assuming that if a notification is dismissed it means the pharmacy is quite busy. You must have the upgraded version of Amplicare Assist in order to adjust these settings. You can always download the newest version here (it's free). 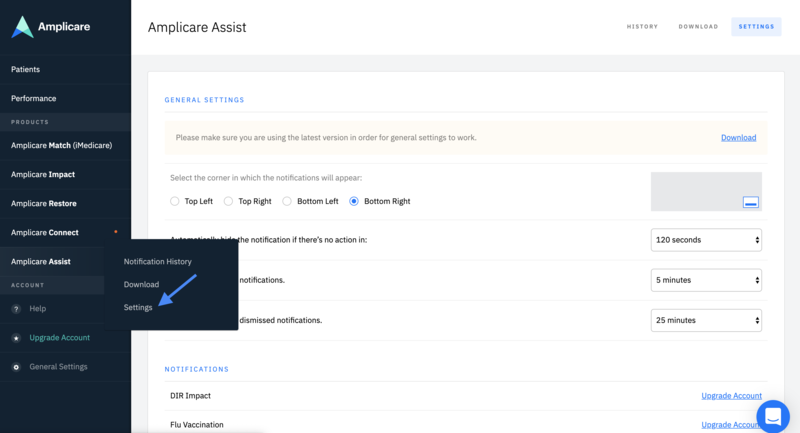 Read this article for a better understanding of the types of notifications you can receive in your pharmacy system with Amplicare Assist!